Malawi's government has invited bids for its 14-seat presidential jet, which is being sold off as part of cost-cutting measures. The office of President Joyce Banda says the plane will be sold to the highest bidder. Her predecessor, the late Bingu wa Mutharika, was strongly criticised for buying the jet five years ago at a cost of about $13.3m (£8.5m). Donors cut aid to Malawi by $4.4 million after the purchase. 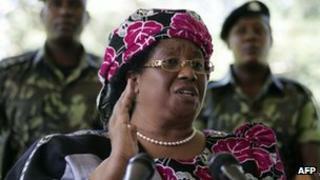 Mrs Banda has refused to travel in the jet since she took office last April, following Mr Mutharika's unexpected death. She has said money from the sale of the Dassault Falcon 900EX would be used to provide basic services for Malawi's poor. The notice said the jet was in "perfect flying condition" and can fly a range of 4,500 nautical miles (8,380 km) non-stop. "The bids will be opened and offers read out in the presence of interested buyers or their representatives and any member of the general public on 20 February." When Mr Mutharika purchased the jet, he said it would be "cheap to run". However, the opposition and donors accused him of wasting money. It was hit by widespread protests over the rising cost of living towards the end of Mr Mutharika's rule. Since taking over, Mrs Banda has taken several steps to improve relations with Western donors.